The dogwood botanically known as Cornus florida is North Carolina’s official flower, but there are other dogwoods indigenous to the East Coast, and, believe it or not, one in particular is showing off right now. No, it doesn’t flower during this coldest time of the year, but it still adds colorful razzle-dazzle to local gardens in the dead of winter. 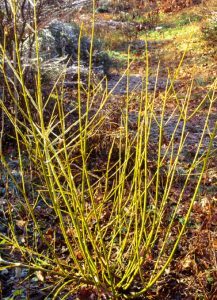 It is called the red twig or red osier dogwood (Cornus sericea), and it is more of a shrub than a small tree like the typical dogwood. 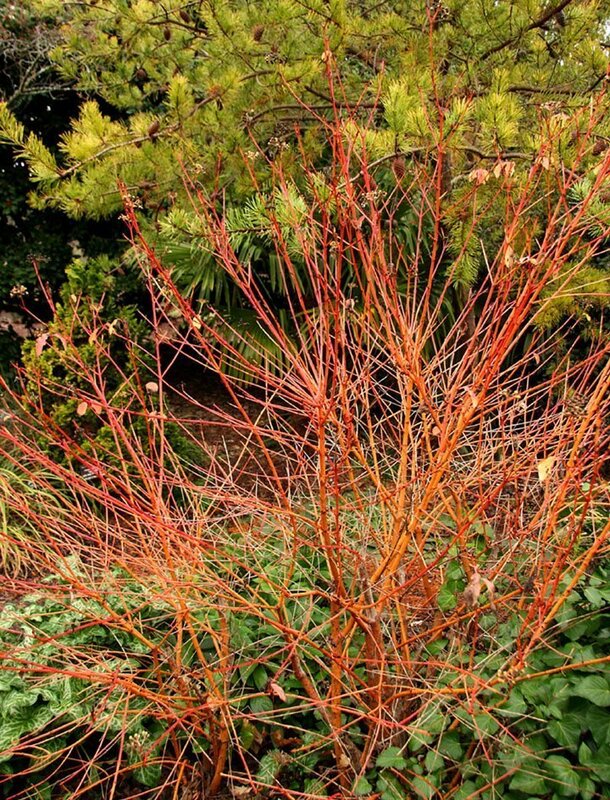 While Cornus florida sports large white flowers, the red twig has clusters of small, star-like blooms in the spring, but in the low winter sun, its bare branches light up the landscape, as their muted reds catch fire in the cold and literally begin to glow. Such winter beauty hasn’t gone unnoticed, as this pretty native is now a quality landscape plant. Many cultivars have even been developed and include the compact ‘Isanti’, variegated-leaf ‘Sunshine’, and ‘Baileyi’, which also has eye-catching, deep red foliage in the fall. 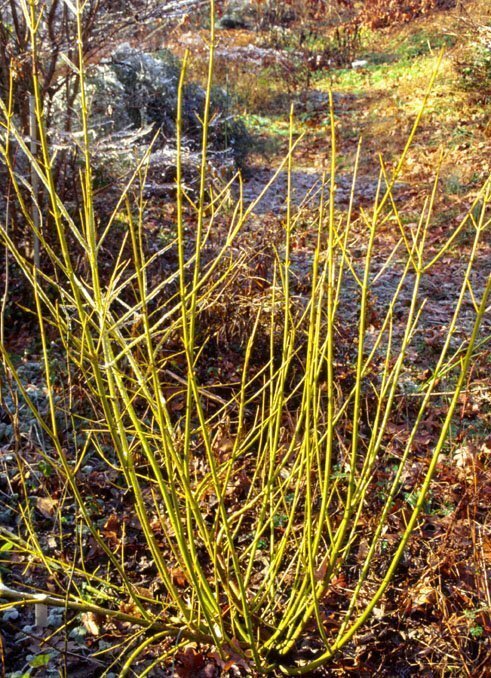 Just to make things confusing, there are yellow colored cultivars of the red twig dogwood. ‘Flaviramea’ has been a standard for years, but ‘Bud’s Yellow’ has shown better disease resistance. And consider the bright yellow stems of ‘Silver and Gold’, which is nicely complemented by variegated leaves during the warmer months. There are also overseas introductions available to compete pleasingly with our hot-colored natives. For instance, see more red with the Tatarian dogwood (Cornus alba), a native of China, which shows off sizzling crimson branches in the winter. 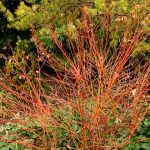 Another showstopper is the bloodtwig dogwood (Cornus sanguinea), an import from Europe that zaps the dull winter landscape with streaks of electric red, orange and yellow. ‘Midwinter Fire’ is one of its better cultivars. Although these dogwoods are hard to miss in the winter landscape, fine-tuning their locations will help make them stand out. For instance, any of the yellow-tinged twiggies will really pop if planted in front of a dark evergreen backdrop of, say, holly, mahonia or privet. Mix bloodtwigs with red twigs and/or yellow twigs to form a massed planting that is a cheerful, motley blend of can’t-miss, bright hues. These special dogwoods will also have brighter colored branches if planted in full sun, but for their overall health, provide some afternoon shade in the summer. In addition, since mature branches tend to dull over time, it is best to prune out older limbs every two to three years.